Sometimes the very simple act of a stock breaking a down trend line at support areas can yield a nice trade for the trader. In this article you will learn how to employ this simple concept to find a great trading opportunity. This trading strategy is suitable for those who want to wisely enter a stock as it bottoms. That is a short term bottom before the stock swings back up for a few days to a week or two. Therefore, the holding period is from a few days to 10 days or more. A downtrend line is simply a line that connects the price of a declining stock to form a nice -45 degree line. Sometimes it can be steeper and at times it can be shallower. What matters is that the trend line is obvious to see. The trader should not find it difficult to draw such a line. Support on the other hand is an area where a stock can be expected to find support. A picture is worth ten thousand words and therefore let me show you some examples of how this trading strategy works and then you can figure it out for yourself. In the chart above you can see ABT breaking above 2 downtrend lines. Stocks that are in an uptrend can often break downtrend lines many times. So its worth it to put uptrending stocks on your watchlist. Just connect the highs of the declining stock prices. The trend line should be easy to draw and you should not make it complicated. Looking at more examples below will help you to learn how to draw trend lines. Now that we have establish that there are 2 trend lines, notice how the stock rose each time it broke above a downtrend line. This is where you buy the stock and put a stop loss at the lows of the trend lines. 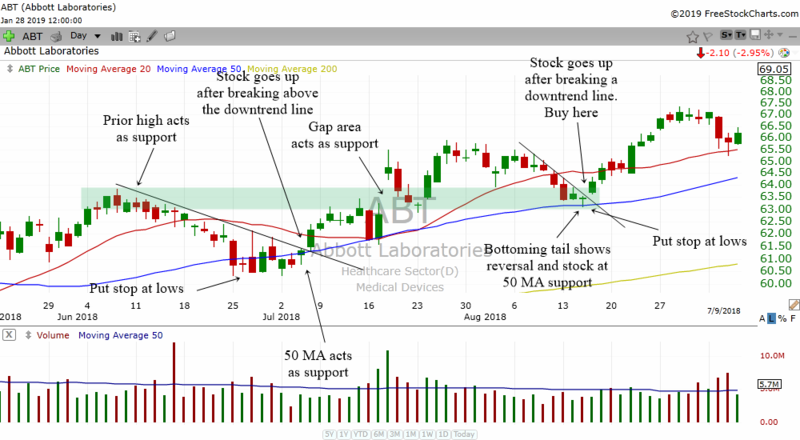 You can see how support areas act to keep the stock from dropping. Prior highs and the 50 MA acted as support for this stock. And when you see a stock break above a downtrend line in these areas, you are probably looking at a very profitable swing trade. The recipe for this trading strategy is this. With this strategy one can aim for at least 1:1 risk reward ratio. Sometimes you can get 1:3. If you see resistance overhead or the stock gets overbought, then it is time to take profits off the table as well. My advice is to sell some when you have a 1:1 and ride the others higher while putting your new stop loss to breakeven which is your purchase price. Below are more examples of how this simple trading strategy works. 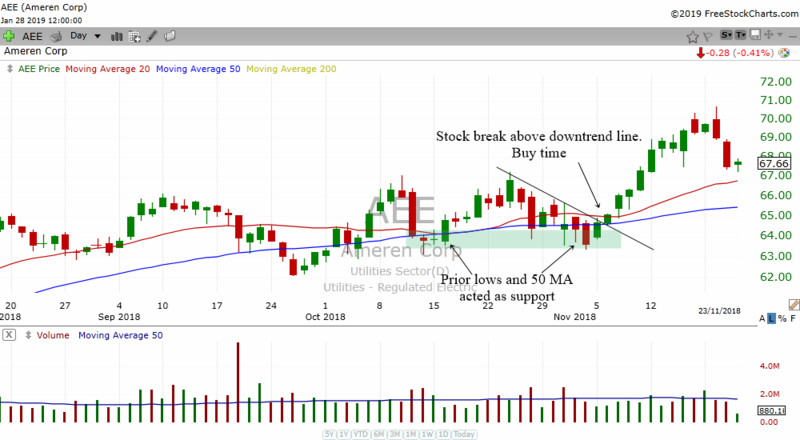 AEE found support at prior lows as well as the rising 50 MA. A break above the downtrend line tell traders its time to buy this stock for a swing trade. AIV had two points of support. First is the prior low and then the 200 MA acted as a powerful support. Notice that the stock also put in a double bottom pattern. In combination with the breaking of downtrend line, the stock was able to recover all of its losses and trade higher. HCP is an example where prior highs can act as support. Remember that some stocks tend to grind higher. Making higher highs then declining back to a prior high area. It is at these areas that the trader should look for breaking of trend lines. 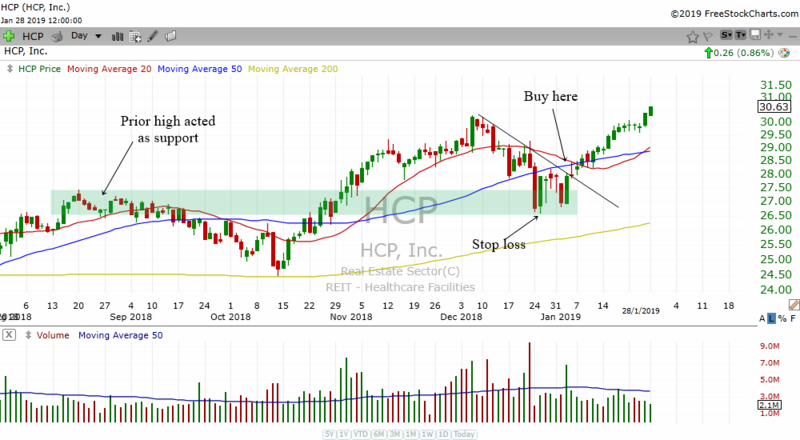 When HCP broke the trend line it shot higher. Trend lines also work very well in futures. For those who trade futures and the main indices, trendlines are very important. The chart of Dow Futures above show how trend lines (even if they are steep) can pinpoint potential reversal areas for a trade. 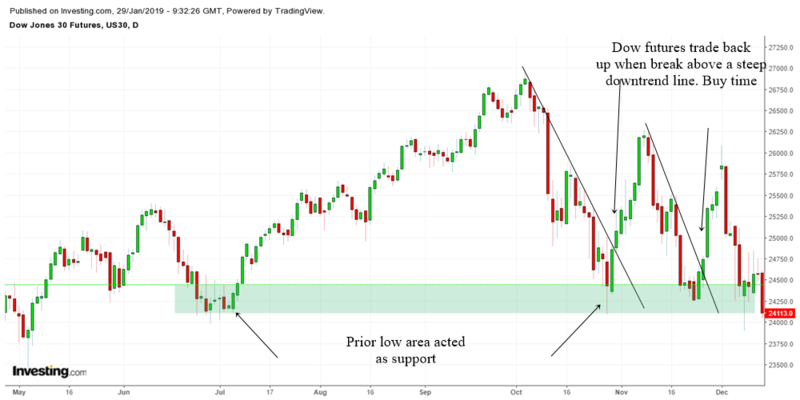 Is stock at price support area? Stock at important MAs like 50 and 200 MA? Is stock in an uptrend? Is it at a Fibonacci area? 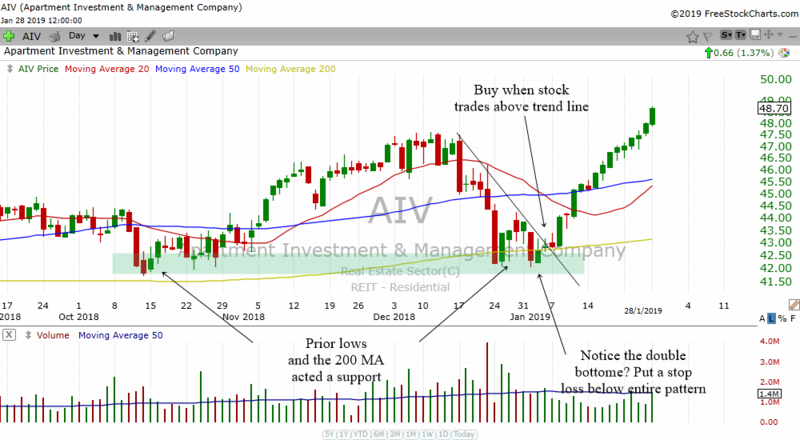 This trading strategy seems to work better when a stock is trading in an uptrend. They also work to an extent in stocks that are trading sideways. However, I would advice you not to place your trade on stocks that are in a downtrend. Any break above the downtrend line will generate only a moderate rise in most circumstances. That's because the trend is down. When the trend is down, odds are the stock will continue to tank. You should be able to find 1 or 2 nice trades in the market per week. Every week, the market will give you a gift. Try not to place to many trades as this is a swing trade. These are two powerful concepts in technical analysis that has stood the test of time. You now have learned how to harness the power of these 2 concepts by combining them into a single trading strategy. Happy trading!